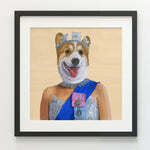 Toronto artist Tony Taylor is obsessed with portraying public figures as animals. From world leaders to celebrities, no one is safe from being featured in one of Tony's oil paintings. Born in Aberdeen, Washington, the prince of Seattle's Grunge sound: Kurt Cobain. Shipping fees are calculated based on the value of your package. Shipping for wood prints starts at around $6. Wood reproductions are printed in the Canada, and are imported directly in order to take advantage of USPS services. You may encounter additional duties or tariffs on orders over $750. All wood prints are shipped with a tracking number. Wood prints are typically in the mail 5-10 business days after placing the order. Shipping rates are calculated based on your zip code, and the weight of the package. Shipping for art prints starts at around $3.50 ($4.50 for Canada). All art prints are shipped with a tracking number. Art prints can be shipped by Economy, Standard, Standard Duties Paid (Canada), Express, or Overnight shipping. Prints are typically in the mail 3-4 business days after placing the order. I recently had the chance to do a commission of baseball legend Roy Halladay. He pretty much was the heart and soul of Jays when he played. I recently had the chance to do a commission of baseball legend Roy Halladay. He pretty much was the heart and soul of Jays when he played. Pearl Jam frontman Eddie Vedder. Pearl Jam frontman Eddie Vedder. Lady Gaga, international music and fashion icon. Queen of the Monsters. Lady Gaga, international music and fashion icon. Queen of the Monsters. The legend with the golden voice: Freddie Mercury of Queen. Captured here in his epic 1985 LiveAid performance. The legend with the golden voice: Freddie Mercury of Queen. Captured here in his epic 1985 LiveAid performance.